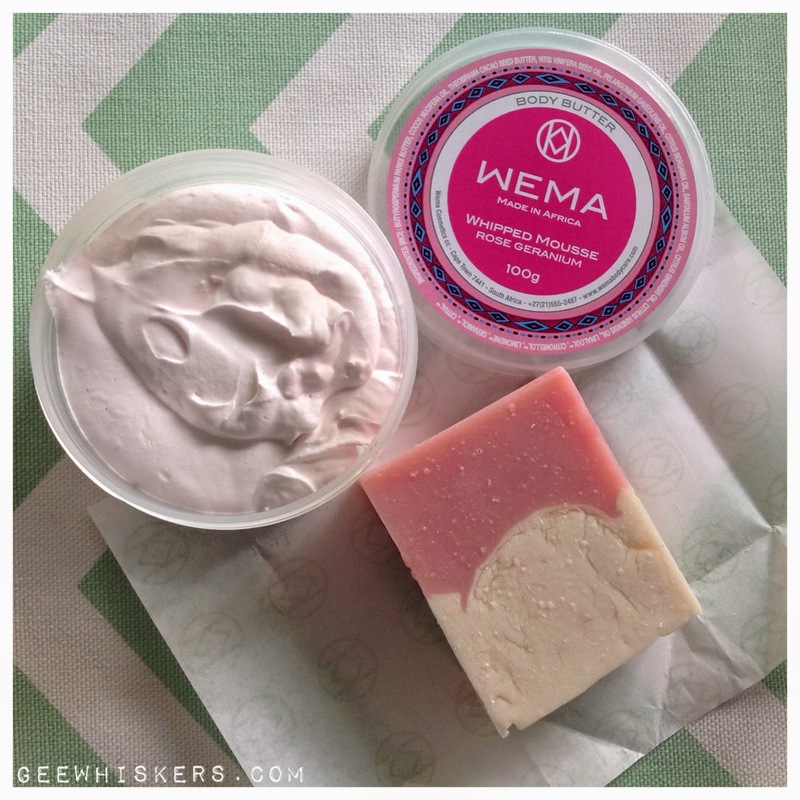 Wema Rose Geranium Whipped Mousse and Soap / Gee Whiskers! One of the great things about being a blogger is that we sometimes get given really fantastic products to test out. I recently received 2 products from Wema Bodycare to test out and I couldn't wait to dive right into testing them. I received a Rose and Geranium Body Mousse and natural soap also in Rose and Geranium. I was tickled pink when I saw that I received products in this fragrance because it is one of my favourites. The natural soaps retail for R60 (buy it here). They are made using a cold press method which ensures that all of the natural ingredients are preserved and you receive the maximum benefits of them during use. The first thing I noticed about the soap was the amazing fragrance - it has a rich scent that literally fills up a room but not in a way that it makes you feel overwhelmed. Once I opened up the wrapper the look of the soap really appealed to me. I love the colour and texture of the soap. The soap contains Mafura butter which softens skin and improved the elasticity. It also helps improve cell regeneration which means you'll have great skin with continued use. Also in the product is Kaolin which cleans pores along with Aloe Ferox, long know for its anti-bacterial and anti-fungal properties. After a bath I can still feel a layer of the oils on my skin leaving my skin well hydrated and feeling silky soft - this is due to the polysaccharides which form a thin film on the skin helping to protect from dryness. The body mousse retails for R150 for 100ml (buy it here). It has been such a treat to use, although I admit that I mostly use it as a hand cream, especially after washing dishes or doing house work. Because it contains cocoa butter, shea butter and grapeseed oil it deeply moisturises and nourishes skin which is exactly what I need after having my hands soaking in a basin of very hot water. The coconut oil in it also has antibacterial properties perfect when you've been doing house work. The coconut oil is also one of the main ingredients in this mousse which is probably why the price is a little steep for 100ml. What I love about this mousse is the fact that it hydrates and moisturises my skin incredibly well. I know after using it my skin will look and feel better almost instantly. The rose geranium fragrance also acts as aromatherapy for me and it is such a treat to open up my tub (which is starting to run quite low now). I always love using brands that are natural and pride themselves in the quality of their products. Another thing I love is that this is a South African brand. There are so many wonderful things on the Wema website that I suggest you go have a look for yourself, click here to go shopping! If located in South Africa you can enjoy free shopping as well. A big thank you to Wema for these fantastic products. I really enjoyed using them and definitely have my eye on a number of products on your website. It is such a nice consistency which makes it a treat to use.